No one wants to get caught breaking a traffic law and while the best practice is to always stick to the rules, it is good to know where to slow down and take extra precaution in Arizona. The key to making sure that you do not get a speeding ticket is knowing the speed limit when you are driving and paying attention to the road signs that indicate this. However, it is also helpful to know where speeding cameras, as well as red light and right turn cameras are placed. 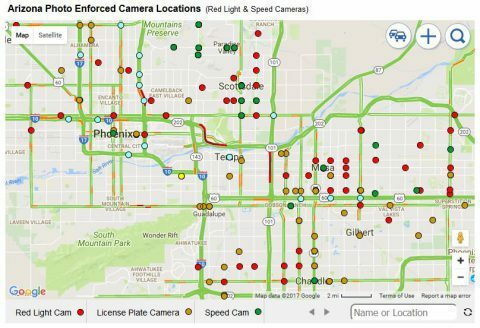 Not only can you get a ticket from the police officers that are monitoring the road, but you can also get one from the cameras that are set up in various areas in Arizona. There are traffic cameras set up to not only monitor speeding but also take a picture of a vehicle that runs a red light, doesn’t stop fully at stop signs, and other traffic violations. Because of this, you need to know where to look for these traffic cameras, so you can make sure that you follow all the rules of the road at all times. Often, you will find that these traffic cameras are set up on the corners of major intersections. There may or may not be signs that indicate the use of these cameras and if you do not take the time to look for them, you may not even know they are there. There are also various types of cameras such as red-light cameras, which are usually the ones found at intersections, traffic cameras, which can be used to catch all kinds of violations at intersections, and speed cameras which can be found at intersections but may also be found on the main interstates and highways in the area. These cameras are designed to not only detect when you are breaking the law while driving but will also take a picture of you and your license plate. If you are found to be in violation, you will have the ticket sent to the address where the vehicle is registered. If you are caught breaking the law and end up with a taffic ticket, you basically have two options: pay the ticket and have points go on your driving record or take an AZ traffic school course instead of paying the ticket and have NO points go on your record. One great option that you have in this case is to take an online defensive driving course. You will be able to take the four-hour course within the comforts of your own home, as well as take breaks as often as you like. The school will be responsible for reporting your completion to the court as well as paying them your court diversion fee and state fees. If you opt to just pay the ticket, your auto insurance will definitely go up. Taking a course through IMPROV® AZ defensive driving school will keep your record clean and your car insurance low. They also keep the material light and enjoyable so that you have a little bit of fun while learning how to drive better… and keeping those points off your record.